1. Open Facebook My Apps. 2. Click Add a New App. 4. Choose a name and select a category for the new app. Then click Create App ID. 5. On the Settings page, click + Add platform and choose Website. 6. Fill App domains and Site URL with the social.uploadcare.com domain and click Save Changes. 7. Go to App Review page and click Start a Submission. 8. Mark following items to a review: "user_likes", "user_photos" and "user_videos" and click Add 3 Items. 9. Provide step-by-step instruction and a screencast that shows how to access the Uploadcare widget and open the Facebook tab. Then submit the app for review. 10. After confirmation, you will get the Facebook App ID and App Secret. 11. 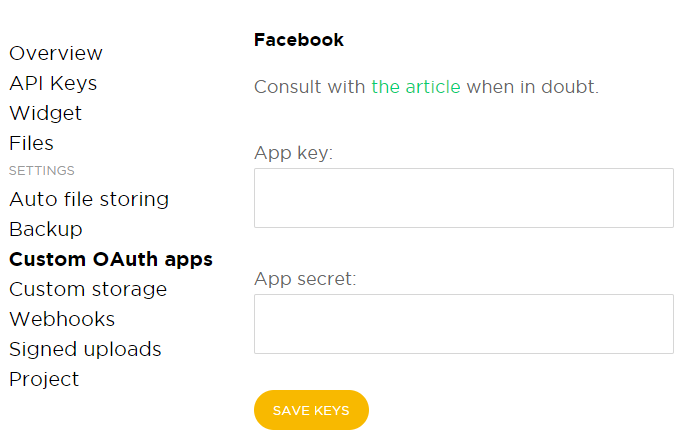 Got to Dashboard, open the Custom OAuth apps page, select Facebook and fill in the App key and App secret fields with the keys you got from Facebook.